This tutorial is the step to learn about how to integrate the Turtlebot robot with the Arm PhantomX Pincher. The objective of this tutorial is to learn how to set up and work with Turtlebot Arm PhantomX Pincher with ROS using the arbotix ROS package. This tutorial was developed for ROS Hydro version. 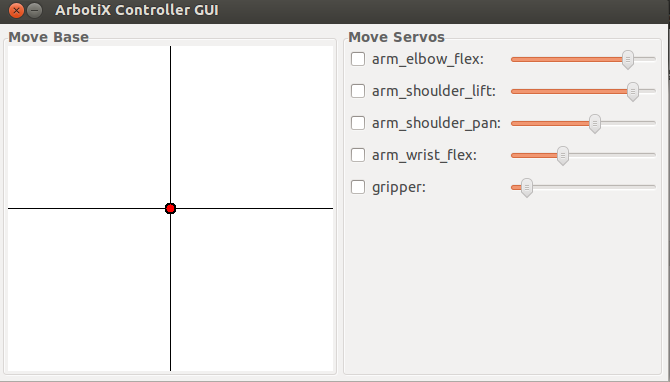 A complete package of turtlebot arm can be found at turtlebot_arm github . This means that all the five servos are active and recognized. As it can be observed, five joints are defined, each joint related to one servo. For example, servo 1 is defined as arm_shoulder_pan_joint. Then, controllers are defined. All joints are of follow_controller type. Consult arbotix wiki page for more details about controllers types and other information. You need to copy and paste the code above in a file with .yaml extension and put in a certain ROS package. let us assume that the file is called turtlebot_arm.yaml and is located in the turtlebot_arm_bringup package. [INFO] [WallTime: 1408457288.608035] Started ArbotiX connection on port /dev/ttyUSB0. [INFO] [WallTime: 1408457288.717421] ArbotiX connected. Simply check any joint and enjoy moving it.